One of the great travesties of the European invasion of the Americas—if you can set aside the genocide, the chattel slavery, and other war crimes—was the destruction of history. Across the continent, invaders burned books, wiped out languages, and replaced ancient cities with their own settlements. That’s what happened in Mexico City, built on the ruins of the Aztec capital of Tenochtitlan. 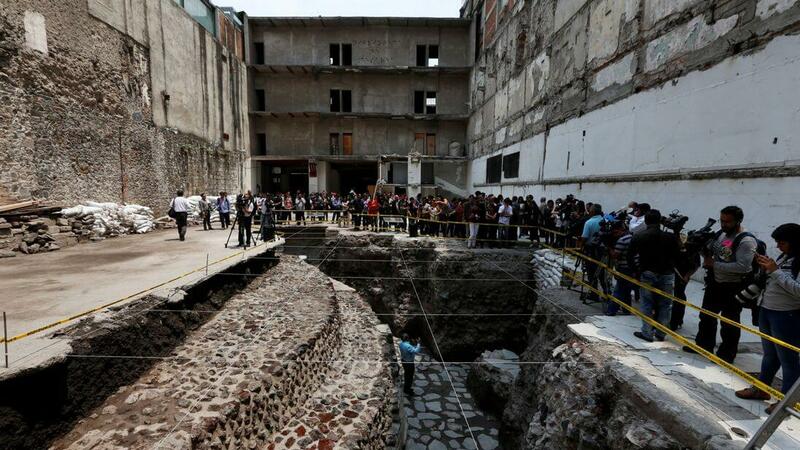 But now, the excavation of an Aztec temple and a ceremonial ball court in the city itself has revealed that history can look strangely familiar to modern eyes. The discovery of this 15th-century ball court and temple has already revealed much about the customs of the Aztecs before the Spanish invasion. The temple was devoted to Ehecatl, a god of the wind, and its prominent, half-circle design would have stood in stark contrast to the angular buildings that made up the rest of Tenochtitlan. The ballcourt may be the more significant discovery, however, because of the role the Mesoamerican ball game played in cultures as far north as Arizona to Nicaragua. The game wasn’t just a national pastime, and that’s putting it mildly. Besides the play area at this particular court, for example, archaeologists unearthed no fewer than 32 severed neck vertebrae—likely belonging to the losing teams. So what was this game that would inspire players to literally risk their necks? Watch And Learn: How Long Have They Been Making Rubber Balls In Mexico?